I am, rather surprisingly for someone who works in the wedding industry and loves every minute of it, not really a girlie girl. 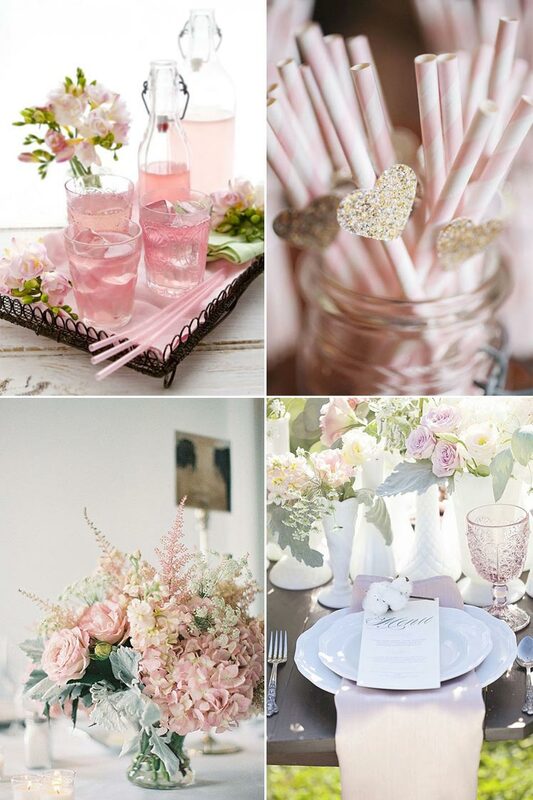 However, I am absolutely head over heels in love with the thought of a perfect pink wedding. This beautiful soft pink is elegant and refined and it’s a gloriously grown-up colour scheme for a romantic wedding day. To my mind, the key to making a pink wedding work whilst avoiding any hint of twee is the colours that you choose to use alongside it and here, you’ve got plenty of choice. These pale pinks look fabulous with glittering golds, natural browns and even with silvery greens. It’s a wonderfully versatile hue so there are a myriad of ways to make it work whatever your style. Firstly, let’s look at your outfit and whether your opt for a subtly coloured or even a pretty printed fabric, it’s easy to bring hints of pink to your wedding day look. Coloured sashes, belts or wraps are wonderful additions and who could resist stunning soft pink shoes peeping from under your skirt? Bridesmaids of course look wonderful in pink dresses and if you want to bring a more modern edge to this traditional colour, why not opt for short dresses or even on-trend separates? Coloured accessories are an absolute must-have and Glitzy Secret’s soon-to-be-released Misty Rose range will bring a brilliant touch of pink to your wedding jewellery – wear just one piece for the merest hint of colour or go bold with hair combs, bracelets, earrings and more. When it comes to flowers to accompany your perfect pink wedding, you are absolutely spoiled for choice. From pillow-soft peonies and timeless roses to black-centred anemones, scented sweet peas and pink berries, there’s certainly going to be something fabulously floral for you. Also, don’t forget to think about the fillers that are added to bouquets and arrangements because I have to say that succulents and slightly silvered greenery look absolutely spectacular alongside pink flowers. They seem to make the pinks softer and even more beautiful. Flowers are also the perfect pink finishing touch to your wedding cake. Whether you go for a more traditional tiered cake with neutral icing or a modern design, flowers will be a touch of luxury to your cake table. I also love glittered cake toppers so if you’re using golden accents alongside your pinks, why not add one too? Also, don’t forget some pink drinks, tasty treats and cocktails (complete with candy striped straws!) because I can assure you, your guests will love you for this. Pink decorative touches throughout your wedding will all combine to bring your colour scheme alive but be sure to mix in your other colours too – this makes the pink pop a little more and provides real balance to the day. Pink napkins against plain wooden table-tops or clean white crockery look fabulous and mismatch pink chairs for a seating area are wonderfully on-trend without looking too sweetly matched. I admit that pink might well be the perfect wedding colour scheme – it’s romantic and elegant whilst giving you the opportunity to add in lots of contemporary twists and personal touches. How utterly perfect!